As the second semester is underway, seniors should start filling out scholarships in preparation for college. The District 211 Foundation offers a variety of scholarships from students which range from school specific to District wide. 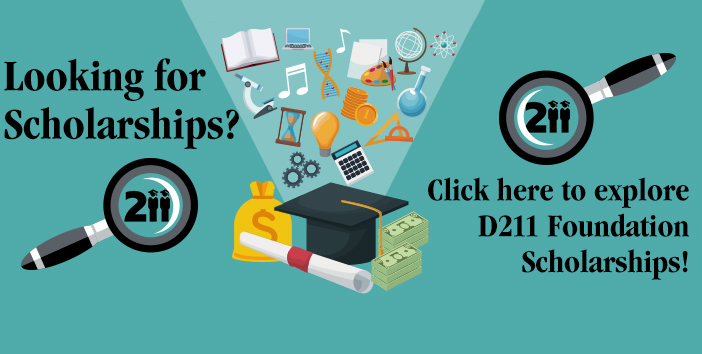 Scholarships offered by the District 211 foundation are available to graduating seniors across the District. While most applications are due by mid-March, students are encouraged to check the foundation’s website (www.d211foundation.org/scholarships) for full details and a list of scholarship opportunities. Last year District graduates received more than $64,000 in scholarships from the Foundation.